Hi! Today I have my New Year's Eve nails to share with you. 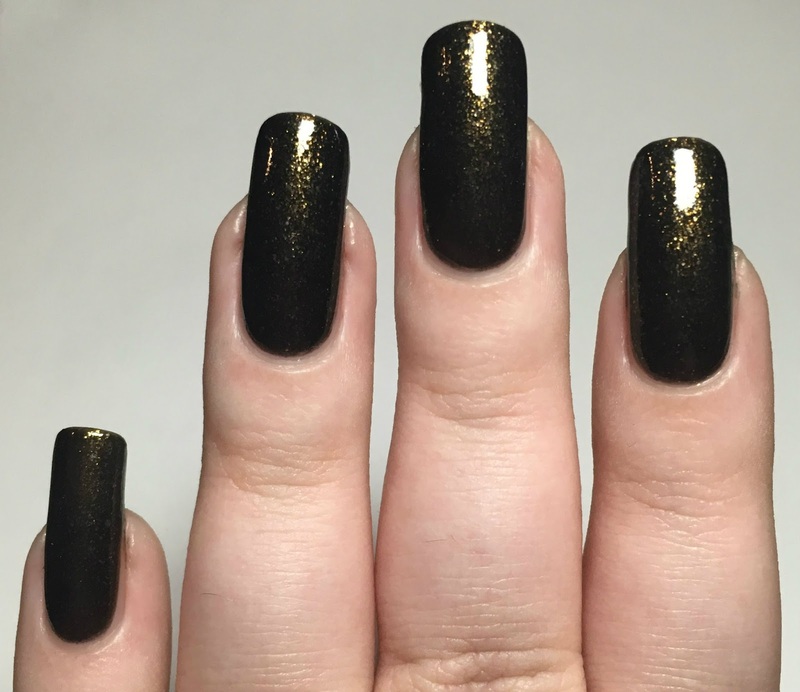 I've had it in my mind for a while that I wanted to use Opulent Essences 'Devils Gold' for New Years, so I created my mani with matching colours (black and gold). I also knew I wanted to add fireworks. Here is what I ended up with. Read on to find out more! Opulent Essences 'Devils Gold' is a black base packed full of gold flakes. The base is more of a jelly, so is fairly sheer on the first coat. That being said, it builds up to be completely opaque with a second. The flakies also lay nice and flat on the nail. Below is two coats and topcoat. For today's mani, I started by painting my index and middle nails with Pretty Serious Cosmetics 'Absence', and my ring and pinky nails with 'Devils Gold'. Both are shown below with topcoat. I then added my fireworks. I used the top left firework image on MoYou London festive plate 05. I stamped over my index and middle nails using all Born Pretty Store items - their clear stamper and scraper, and bright gold stamping polish. I placed the image 'upside down' on one nail to make it look like different fireworks. I finished with a coat of topcoat. What do you think? I'm actually quite happy with these! I think the combination works quite well together, and it definitely feels very celebratory! 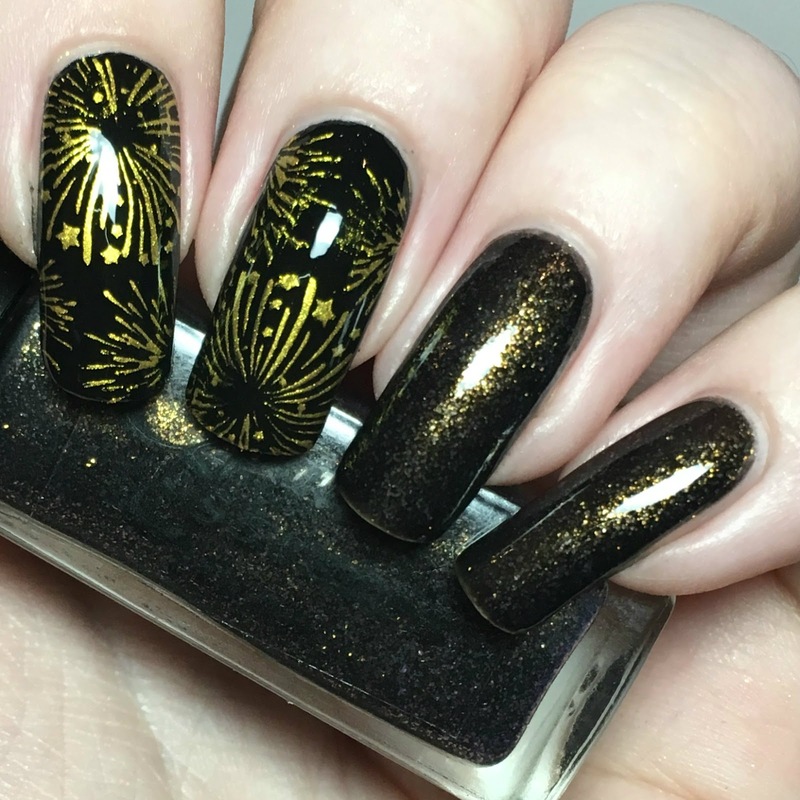 I always put fireworks on my nails when I can - because who doesn't love a good firework?! This is now my last post until January (and for the whole of 2017), so Happy New Year everyone! Opulent Essences are currently having a break, but will hopefully be back soon. You can follow them on Instagram here for updates. Devils Gold looks amazing on you! 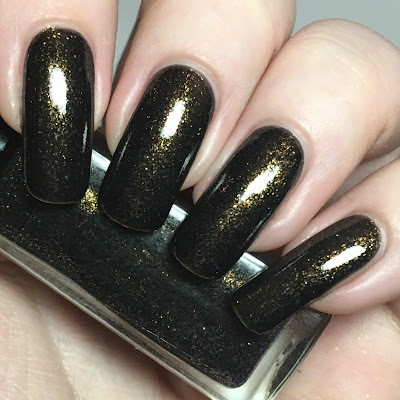 Love your stamping, you just can't go wrong with black and gold for NYE! I love your base polish! It plays perfectly with the stamping! 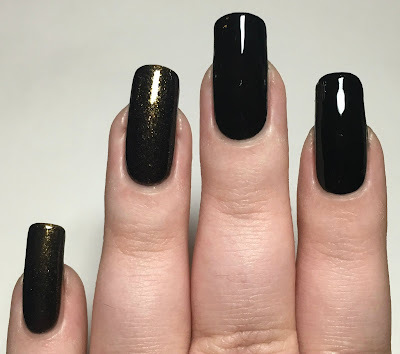 Such a perfect NYE mani!! I just chopped my nails quite short but now I'm wishing they were longer to do black nails with some gold shimmer. Two of my favorites together and this looks awesome. My nails grow quickly so I'm looking forward to checking this out. This is gorgeous - I love how the fireworks complement the gold microflakes. I love the shimmer in that polish. I really like this! So pretty! I love this combo!!!! Simply gorgeous and perfect for NYE!!! I love the colour combo you used for this mani and nail art. The colors are perfect! So fun & festive. Devil's Gold is gorgeous! I love the look you did here. Happy new year! Loooove these - your stamping is fabulous! Happy New Year! This looks great. 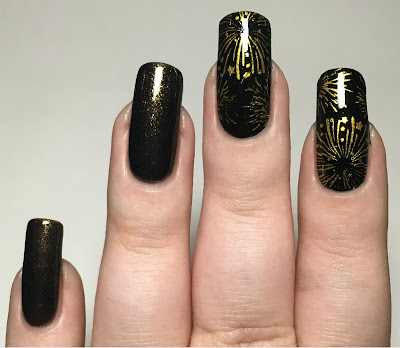 I love that base combination with the gold stamping!